Health Savings Accounts Fill Multiple Tax Needs - Article | Candace Ebert & Co. The Health Savings Account (HSA) is one of the most misunderstood and underused benefits in the Internal Revenue Code. Congress created HSAs as a way for individuals with high-deductible health plans (HDHPs) to save for medical expenses that are not covered by insurance due to the high-deductible provisions of their insurance coverage. However, an HSA can act as more than just a vehicle to pay medical expenses; it can also serve as a retirement account. For some taxpayers who have maxed out their retirement-plan options an HSA provides them another resource for retirement savings – one that isn’t limited by income restrictions in the way that IRA contributions are. Although the tax code refers to these plans as “health” savings accounts, they can also be used for retirement, as there is no requirement that the funds be used to pay medical expenses. Thus, a taxpayer can pay medical expenses with other funds, thus allowing the HSA to grow (through account earnings and further tax-deductible contributions) until retirement. In addition, should the need arise, the taxpayer can still take tax-free distributions from the HSA to pay medical expenses. Withdrawals from an HSA that aren’t used for medical expenses are taxable and – depending on the taxpayer’s age – can be subject to penalty. Once a taxpayer has reached age 65, nonmedical distributions are taxable but not subject to a penalty (the same as for a traditional IRA). At the same time, regardless of age, a taxpayer can always take tax-free distributions to pay medical expenses. Example: Henry is age 70 and has an HSA account from which he withdraws $10,000 during the year. He also has unreimbursed medical expenses of $4,000. Of his $10,000 withdrawal, $6,000 ($10,000 – $4,000) is added to Henry’s income for the year, and the other $4,000 is tax-free. must NOT be claimed as a dependent on someone else’s return. Any eligible individual – whether employed, unemployed or self-employed – can contribute to an HSA. Unlike with an IRA, there is no requirement that the individual have compensation, and there are no phase-out rules for high-income taxpayers. If an HSA is established by an employer, then the employee and/or the employer can contribute. Not just family members but any other person can also make contributions to HSAs on behalf of eligible individuals. Both employer contributions and employee contributions made via the employer’s cafeteria plan are excluded from the employee’s gross income. Employees who make HSA contributions outside of their employers’ arrangements are eligible to take above-the-line deductions – that is, they don’t need to itemize deductions – for those contributions. Example – Family Plan Does Not Qualify: Joe has purchased a medical-insurance plan for himself and his family. The plan pays the covered medical expenses of any member of Joe’s family if that family member has incurred covered medical expenses of over $1,000 during the year, even if the family as a whole has not incurred medical expenses of over $2,700 during that year. Thus, if Joe’s medical expenses are $1,500 during the year, the plan would pay $500. This plan does not qualify as a HDHP because it provides family coverage with an annual deductible of less than $2,700. 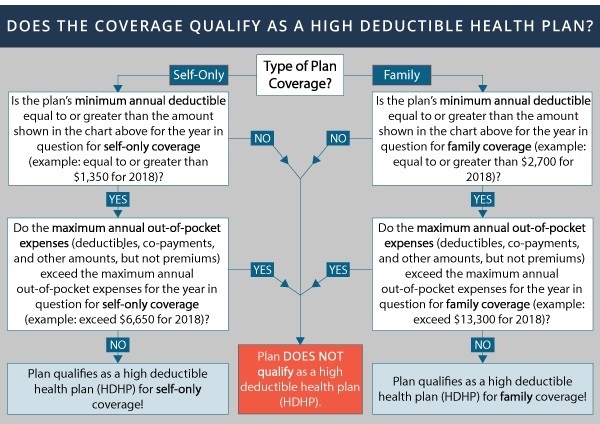 Example – Family Plan Qualifies: If the coverage for Joe and his family from the example above included a $5,000 family deductible and provided payments for covered medical expenses only if any member of Joe’s family incurred over $2,700 of expenses, the plan would then qualify as a HDHP. Maximum Contribution Amounts – The amounts that can be contributed are determined on a monthly basis and are calculated by dividing the annual amounts shown below by 12. Thus, if an individual’s health plan only qualified that person for an HSA for 6 months out of the year, then that person’s contribution amount would be half of the amount shown. In addition to the amounts shown, an eligible individual who is age 55 and older can contribute an additional $1,000 per year. How HSAs Are Established – An eligible individual can establish one or more HSAs via a qualified HSA trustee or custodian (an insurance company, bank, or similar financial institution) in much the same way that an individual would establish an IRA. No permission or authorization from the IRS is required. The individual also is not required to have earned income. If employed, any eligible individual can establish an HSA, either with or without the employer’s involvement. Joint HSAs between a husband and wife are not allowed, however; each spouse must have a separate HSA (and only if eligible). If you have questions related to how an HSA could improve your long-term retirement planning or health coverage, please call this office.